Last week, the American Library Association released its list of the most frequently challenged books in America in 2014, and three graphic novels were included: Saga by Brain K. Vaughan and Fiona Staples, for sexual content; Persepolis by Marjane Satrapi) for its images of torture; and Drama by Raina Telgemeier. 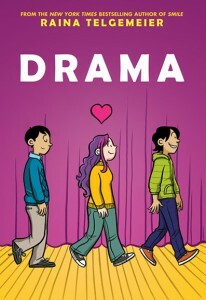 Drama also received the Stonewall Book Award, and it is a top selling graphic novel in bookstores throughout this country. The book has a diverse cast of characters, including a few gay teens who either already knew they are gay or are slowly realizing it. That said, Telegemeier treats this as a non-issue, and aside from a few flirty kisses (one of Callie’s lands squarely on her crush’s cheek), there’s little depiction of romantic contact between any characters. Drama, which is recommended for ages 9-14, is a fictional story about seventh-grader Callie, who, like many kids her age, wrestles with a pesky, snooping little brother while navigating middle school friendships and crushes. The interesting thing about Callie is her passion around being on the Drama Club’s tech crew and interacting with her friends in the club. What makes this book so special though, is its message to young girls. Specifically, what makes Callie happiest is not being cool or popular or even winning “the boy.” Instead, it’s working hard on her set ideas, becoming the best stage manager ever of the Drama Club, and refining her voice, her vision, and her skills within that role. Drama is a funny feel-good book about navigating the trials and tribulations of middle school. It emphasizes the importance of finding one’s voice as well as emphasizing the need for teamwork and consideration. depicts school-girl crushes and travails with humor and sensitivity, relayed through her engaging text, wonderfully expressive characters, and her colorful and engaging visual montages. The art conveys a sense of place, touch, and feel. You can feel the red velvet seats and the pre-show jitters and excitement. 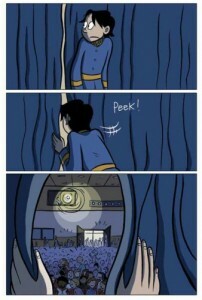 You can feel the tension, you can feel the excitement, and you can practically feel the cannon’s wet confetti. Finally, Telgemeier mixes humor, tension, confusion, passion, and fun as she tells Callie’s story. Drama, is set up like a play. It begins with an overture of musical text flowing from panel to panel, ending with three characters entering the stage. It has four acts that begin with the announcement of this term’s play and continue with casting, directing, and preparing for opening night. There is an intermission during which we see guests entering the theater as the stage crew works frantically to set the stage, and then an entr’acte, leading into a fifth act, covering the three nights of the play, and the final act, detailing the aftermath of the play and its players. While set up like a play, and following Eucalyptus Middle School’s Drama Club production of “Moon Over Mississippi,” Drama is more about central character Callie and her friends than it is about the play. We follow Callie as she navigates her friendships and school crushes while creating a set worthy of Broadway within her middle school’s paltry budget. Act 1 begins with Callie walking home from school with Greg and his younger brother Matt. Matt’s hoping Mr. Madera will let him operate the spotlights again this year, even after a slight debacle last year. Greg then asks Matt to go on without them because he needs to talk with Callie. He tells Callie he just broke up with Bonnie, and while Greg is upset, she’s thrilled and gives him a peck on the cheek. Over the next few days Greg ignores and avoids her, and Callie finds out he’s back with Bonnie. Callie, feeling confused and rejected, realizes she’s got to get over this crush. She gets more and more involved with the drama club, designing the play’s sets (including a confetti-shooting cannon and a leaf-dropping magnolia tree). At the same time, she meets two twins, Jesse and Justin. Might Jesse be her new crush? 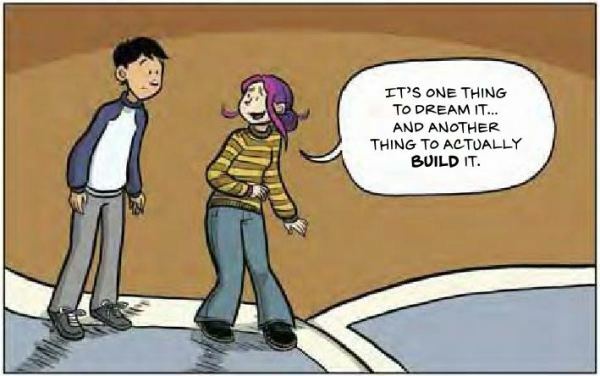 Telgemeier’s art is another special facet of this book. The art and text weave the story, alternating between whether the art or text has the stronger voice, while both are equally engaging. One outstanding example, however, of Telgemeier’s powerful visual storytelling comes as Callie shows Justin her favorite book. 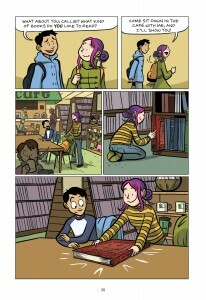 In the first few panels, Callie leads Jesse to the book (as Justin checks out some manga). Taking it out of its shelf, Callie hugs it, and in the next panel we see her and Jesse walking into the book, sitting on the pages as if they’re sitting in the sets themselves as the book, at least for Callie, becomes larger than life. Then there’s Callie herself. Callie’s ability to be so swept away in her passions makes her even more endearing and real. We love her quirkiness, her focus, and her determination as well as her vulnerability and cluelessness about boys. Finally, there’s her inner strength that is so engaging, empowering, and refreshing. Callie speaks her mind, and while often insecure and uncomfortable with certain parts of herself, she’s fine with the fact that she can’t sing, she embraces and follows her ambitions, and she never lets her relationships or felled crushes diminish her confidence or her dreams. 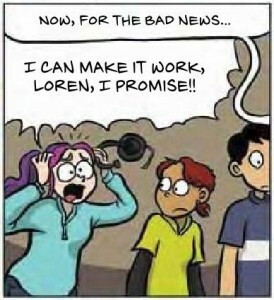 Finally, there’s Telgemeier’s portrayal of diverse characters from the stage crew — from geeks to the cool kids and jocks. There are kids of different ethnicities and cultural heritages, and all of them, regardless of color, background, size, or shape, are wresting with who they are. This in part,is why a few characters’ discoveries or realizations that they are or may be gay are such a non-issue. In fact the characters’ announcements that they are or may be gay are the only parts of the story in which there actually is no drama. In short, this is a coming-of-age story as a young teenager learns to follow her passions, navigate friendships and crushes, and learns, along with her friends and peers, how to feel comfortable within one’s skin while embrace personal strengths, weaknesses, and quirks. How to navigate middle school friendships and crushes. Discuss different types of friendships one might have with others. Detail what it means to be a good friend. Discuss the challenges we have in determining and maintaining friendships and why this is so important. Discuss different passions/hobbies your children/students may have and how they might continue to pursue them. Discuss how it may feel when those passions aren’t “typical” passions/hobbies. Discuss the challenges of being an individual while belonging to a group. Discuss the challenges of putting on a theatrical production, working within limited budges while trying to create the best sets, props and costumes possible. Telgemeier uses text, image, expressions, body language, and inference to let us know how and what her characters are thinking and feeling. Chart and discuss how she uses and integrates these techniques. Throughout the book, we see Matt on the periphery and at one point (p. 62), Callie asks her friend Liz, “What is Matt’s problem?” What is Matt’s problem? Why does he act the way he does, and how might he resolve his problem? Why can’t Callie recognize his problem? 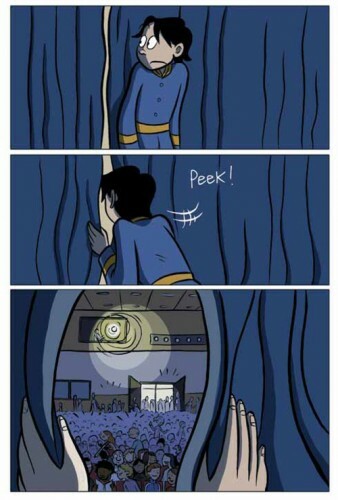 What is Matt’s role throughout this story? Throughout the book, the characters grapple with insecurities and anxieties. Chart and plot the insecurities and anxieties, and evaluate how the different characters effectively or ineffectively deal with them. Brainstorm more appropriate solutions. 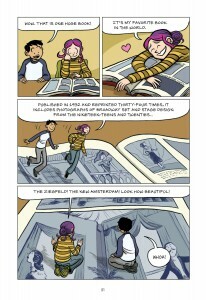 Discuss how Drama is a cross between a book and a play while being a graphic novel. What literary techniques does Telgemeier use to create this feel? After reading through “Moon Over Mississippi,” Callie comments on how romantic the script is and how “audiences love a sentimental love story.” Mirko, not quite sure about this, responds, “But what about Shakespeare? His most successful plays were tragedies?” Continue this discussion with your students. Evaluate what they think makes the most successful plays and how sentimental love stories and Shakespeare’s works fit into students’ interpretations. Have students share their own stories of feeling different or their stories of trying to fit in. Compare how the stories are told, and chart the words used to relate their challenges and their feelings. Evaluate how she visually and textually creates the feel of a play. Evaluate and discuss how Telgemeier creates the feel of the theatre, of the players, and of the drama surrounding them. Evaluate and discuss how Telgemeier uses facial expressions, panel size and shape, and page design to create tension. For example, examine pp. 15-17, as Callie realizes Greg was not at baseball practice as he said he was. 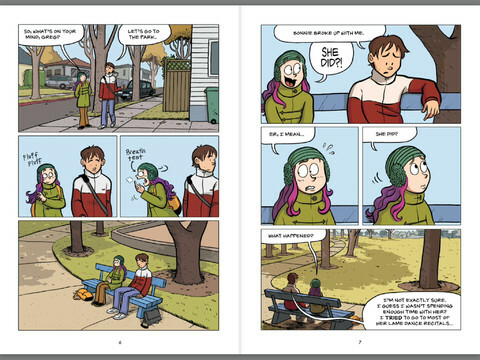 Compare when Telgemeier uses a full-page single-panel splash versus pages with multiple panels. 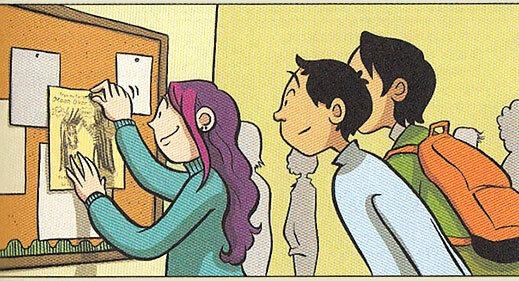 Chart when she uses single-panel splashes to emphasize key events or separate chapters and slow the reader down to emphasize particular points of the story, and discuss how effective this method is when storytelling with images. Telgemeier discusses the importance of color both in the use of contrasting colors to help characters stand out and in creating the right mood. Research primary, additive, and subtractive color models. Discuss how different colors evoke different emotions and how complimentary and reciprocal colors can be used for different purposes (see the resources below). Smile by Raina Telgemeier — an autobiographical coming-of-age memoir in which Telgemeier ruminates with humor and honesty on the tumultuous challenges and perils of her tween years, from the trauma of falling one night on her way home from a Girl Scout meeting and severely injuring her front teeth to dealing with boys, earthquakes, and the true meaning of friendship. No More Dead Dogs by Gordon Korman — about theater productions gone wrong. The main plot revolves around a play based on Old Shep in which the ending has been changed to let the dog live. Nothing Can Possibly Go Wrong by Prudence Shen and Faith Erin Hicks — while for slightly older kids, the characters in this book are a real and life-like as Callie and her friends. Hereville by Barry Deutsch — about another strong-willed girl who is Jewish Orthodox and is different from the other girls in her community. Chiggers by Hope Larson — a young adult graphic novel about the friendships, fun, and foils of summer camp. Amelia Rules! by Jimmy Gownley — an empowering, heart-warming story about Amelia Louise McBride, who moves with her mom to a small town in Pennsylvania to live with her uber-cool aunt Tanner after her parents’ divorce. 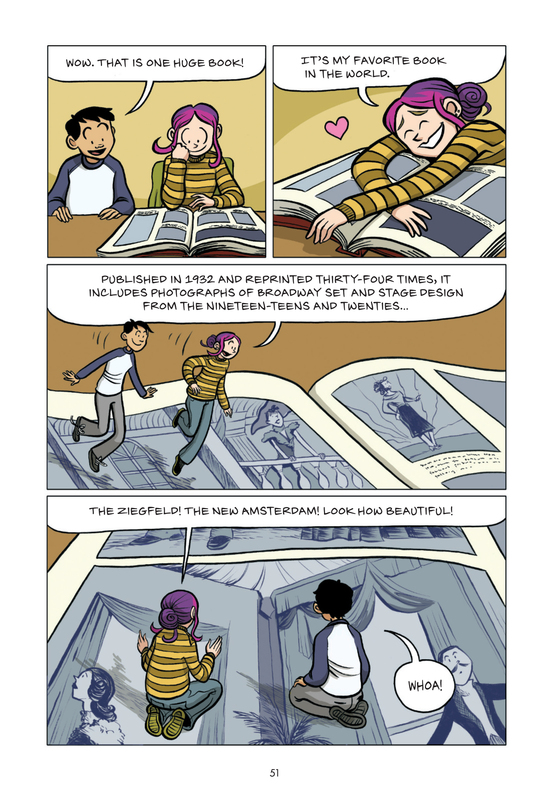 Stuck in the Middle: Seventeen Comics from an UNPLEASANT Age edited by Ariel Schrag — an anthology of comics by critically acclaimed cartoonists who take a bitingly honest look back at their “awkward” middle-school years, reflecting upon them with sensitivity and some humor. 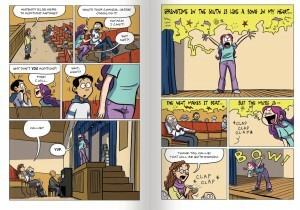 http://wn.com/raina_telgemeier — a presentation that Telgemeier made at the 2012 National Book Festival about her books and work that demonstrates how she works as she tells her stories, with examples of real-life incidents from an audience of students. http://departingthetext.blogspot.com/2013/01/color-casts-powerful-messages-learn-how.html — a blog post on learning how to use color, with additional links and resources. http://char.txa.cornell.edu/language/element/color/color.htm — discussing color, value and hue, along with color illusions and psychological implications of color. All images (c) Raina Telgemeier.